After a test or survey has been created in Blackboard and the students have taken it the Grade Centre can be used to access the results. It will also alert you to tests that require your attention (for example a test that included a short essay question). 2. Tests and Surveys created in Blackboard will automatically have a Grade Centre column created. Within such columns results will be posted after students have completed them. 3. Note that by clicking on Icon Legend you may bring up an explanation of any symbols shown within the Grade Centre. 4. If you wish to see how a student answered an online test that you have created, hover your mouse over their score so that a double arrow symbol appears, click on this to bring up a pop up menu and select Grade Details. If a student has not completed an assessment a dash – will appear. An exclamation mark ! will be shown in the place of a score when an assessment requires your attention, e.g. to mark a short essay question. To do this click on the exclamation mark. A padlock is shown where a student has begun an assignment but not yet completed it. A tick appears by completed surveys. Note that because Surveys are anonymous you cannot view how an individual has responded to it, only how the group has responded as a whole. 5. From the Grade Details page click on Grade Attempt to view the student’s answers to the test. Note that if there are multiple attempts you may view them all by clicking on View Attempts. 6. To view how all students answered a test, or to view survey results, click on the double arrow symbol at the top of the column next to the name of your test or survey and select Attempts Statistics. Item Detail will provide a list of statistical information including Variance and Standard Deviation. Results of tests and surveys may be downloaded and used for statistical analysis through applications such as Excel or SPSS. To use any of the above features click on them and follow the on-screen instructions. 8. If you wish to download results to Excel, click on Download Results. 9. Select Tab to create an Excel file, or Comma to create a comma separated file (CSV). 10. Choose whether the format produced should be By User or By Question and User. The format listed By User will include all of the questions for a user in one row. The format listed By Question and User will list each question for each user in a separate row. Regardless of this, choose the format By Question and User for assessments longer than 40 questions. 11. Choose which attempts to download. All attempts for this item may be downloaded under All attempts. Downloading Only valid attempts will only use the attempt that is being graded. For example, if the grading option is Last attempt then only the last attempt will be provided. If the Grading option is Average, all attempts will be provided. 12. Click on Download results. 13. Choose whether to open the file straight away, or save it to your computer. Blackboard can be used to faciliate online tests and surveys. Please note that iSolutions recommend Blackboard only for formative assessment. For summative assessment, or assessments using question pools, use the Perception CAA service. Use the guides listed below to build a Blackboard test or survey. Please note that Surveys are anonymous. Blackboard provides a number of different question types that you may use when creating a test or survey. Follow the guides listed below to find out how to use each question type. A Calculated Formula question contains a formula, the variables of which can be set to change for each user. The variable range is created by specifying a minimum value and a maximum value for each variable. Answer sets are randomly generated. Calculated Numeric questions require the student to enter a number as an answer to a specific question. The behaviour is similar to a fill in the blank question. Either / Or Questions require the student to choose from two possible answers. A choice of answers is available: Yes / No, True / False, Agree / Disagree, and Right / Wrong. Essay Questions allow text to be entered into a text box. This text is not automatically marked and will require manual marking. File Response Questions allow students to upload files to answer a question. Fill in Multiple Blanks Questions are like fill in the blank questions, but with more than one blank. Text is entered with variables in square brackets used to mark where blanks should be. Then the variables are matched with the answers. Fill in the Blank Questions require the student to type in a single word answer. This has to match the answer (and any varients) that you mark as correct. 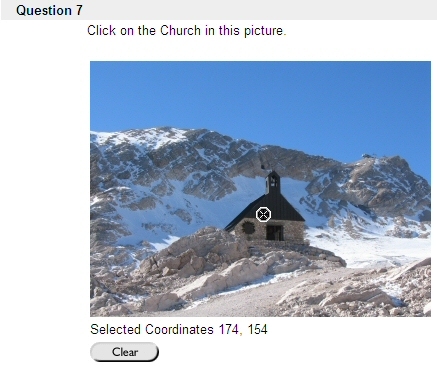 Hot Spot Questions require the student to click on a picture in order to answer a question. Jumbled Sentence Questions require a student to complete a sentence, choosing words using drop down lists. Matching Questions require a student to match one value to another. This could be matching text to text, text to pictures, pictures to sound clips and so on. Multiple Choice Questions require a student to answer a question by selecting a single answer. Opinion Scale/Likert Questions are usually used in surveys. The respondent is asked to state their opinion based on a scale. Ordering Questions require the student to put a number of items. This could for example be chronological or procedural. Quiz Bowl Questions present an answer and require the student to type in the question. Short Answer Questions allow text to be entered into a text box. This text is not automatically marked and will require manual marking. 1. From your test canvas, select Quiz Bowl from the drop down menu and click on Go. 2. Enter the question text, which should be an answer, followed by a statement asking for the question that goes with it. In the above example the question reads The answer is iSolutions but what is the question? 6. Partial Credit % is the amount of credit that will be given to answers that include the correct phrase but do not include the correct interrogative word. 7. Choose the interrogatives that should be used by the student, by default there are four. You may remove superfluous ones or add extra ones. 8. Here you enter any phrase the student must use with an above interrogative in order to get the question right. The answers are not case sensitive. 13. Click on Submit to finish. 14. This is how the question is presented when a student takes a test. The answer has already been typed in. Short Answer Questions allow text to be entered into a text box. This text is not automatically marked and will require manual marking. There is a current issue with Blackboard 7.1 regarding this question type – if Force Completion is not set when deploying a test a student can save their work and go back to it later. If a student tries to save an Essay or Short Answer Question the text box will clear and nothing will be saved. Until this bug is fixed by Blackboard we do not recommend using this question type unless Force Completion is set when deploying the test. 1. From your test canvas, select Short Answer from the drop down menu and click on Go. 6. Enter a model answer in the text box. 6. Add categories and keywords if you wish. 1. From your test canvas, select Opinion Scale/Likert from the drop down menu and click on Go. 3. If the question is for use in a test, assign the number of points the question carries. 6. Set whether the answers should be displayed vertically or horizontally. 7. If you wish for partially correct answers to receive any credit select Allow Partial Credit. 8. If you wish to have the answers shown in a random order set this option. 9. Set the number of possible answers. By default this is 6. 10. Fill in the answer item fields. By default the values “Strongly Agree”, “Agree” etc are filled in. If this is a test question, mark which answer is correct by placing a dot in the circle to the left of the answer. 11. Enter feedback for correct and incorrect answers. 12. Add categories and keywords if you wish. 1. From your test canvas, select Matching from the drop down menu and click on Go. 6. If you wish for partially correct answers to receive any credit select Allow Partial Credit. 7. If you wish to have the answers shown in a random order set this option. 8. Set the number of possible question items. 10. Set the number of answers. This can be more than the number of question items if you wish to add distractors. 11. Fill in the answer item fields in the order the items will be displayed when a student takes the test. You do not need to put these in the correct order at this stage. 12. Click on Next to proceed to the next page. 13. Match the question items to the answer items to set the correct answers. 14. Enter feedback for correct and incorrect answers. 15. Add categories and keywords if you wish. 16. Click on Submit to finish.